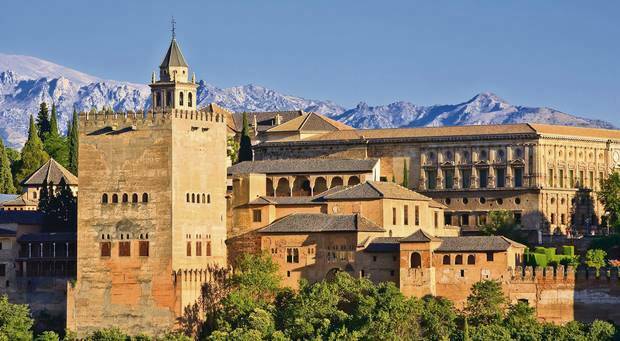 After seven centuries of Arab (Moorish) rule in Spain, its last stronghold, Granada changed hands on January 2, 1492. At the time of Granada’s fall, the Nasrid Dynasty had ruled it from 1238 until 1492 AD. The last ruler of Granada, Muhammad XII Abu ‘Abd Allah (called as Boabdil), surrendered it to King Ferdinand and Queen Isabella on November 25, 1491 who entered Granada and moved into Alhambra by January 2, 1492. 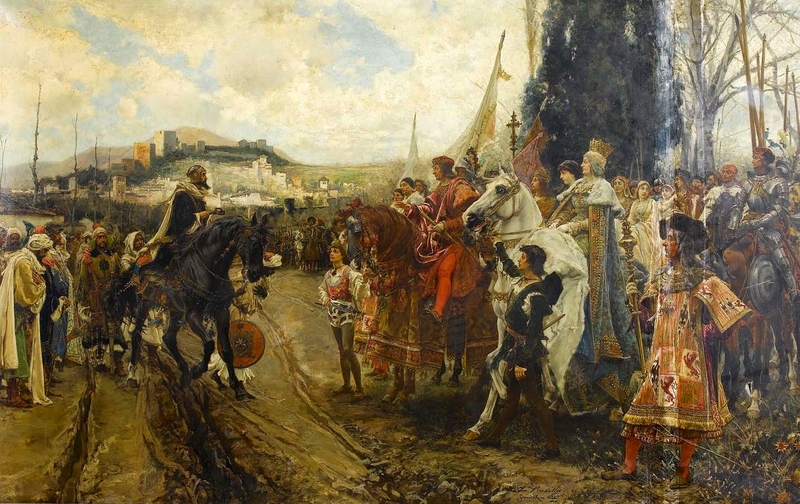 A painting depicting the surrender ceremony still hangs on the wall of Granada Cathedral (built on the site of an earlier Mosque) where both Ferdinand and Isabella are entombed. According to the terms of the surrender, Boabdil was awarded the region of Las Alpujarras, as his personal fiefdom. This article deals with the 70 km-long jumble of valleys known as Las Alpujarras, an insolated, sparsely populated, rugged region between the Sierra Nevada and the lower Sierra de la Contraviesa, where lies one of the “oldest and picturesque crannies of Andalusia”. 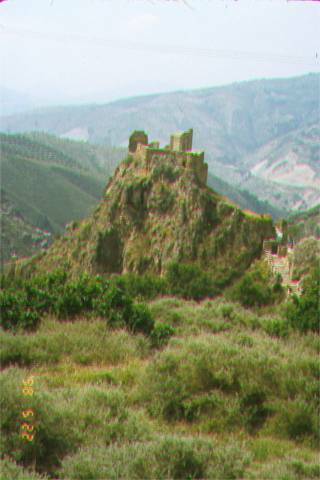 It was this area where the Nasrid ruler (Boabdil) and his entourage moved after the fall of Granada, where they stayed until October of 1492 when he departed for Morocco. Very little is known of him thereafter. (Juan Lalaguna, A Traveller’s History of Spain. 1999). According to the records, the Arab (Moorish) population of Los Alpujarras rebelled repeatedly in the 75 years that followed the fall of Granada. In 1572, the last rebel leader Fernando de Valor, also known as Aben Humeya (Muslim name: Maulavi “Abd Allah Muhammad ibn Umayya) was defeated by King Philip II with the help of Don Juan of Austria. Our visit (2008) to Granada and its Alhambra Palace, with its heavenly gardens, left an unforgettable mark on our memories. To me it seemed a “paradise on earth“, a unique artistic and architectural achievement, unmatched by any human creation to date, an exceptional testimony of the glory of Muslim Spain. On the last day of our stay in Granada, we drove around Granada one more time. We rushed to visit our favorite places: the cafe on Calle San Juan de Los Reyes for our croissant breakfast and cafe con leche, and to the department store: El Corte Ingles, to buy Spanish olive oil. Does it sound crazy to carry olive oil all the way to Canada? not really. There is no olive oil like Spanish olive oil, specially the we bought. As we were leaving Granada, I decided to stop at the spot where Boabdil bid his Alhambra farewell. On the outskirts of the City, I noticed, to my surprise, a sign, which read: ‘Boabdil’s Restaurant’. 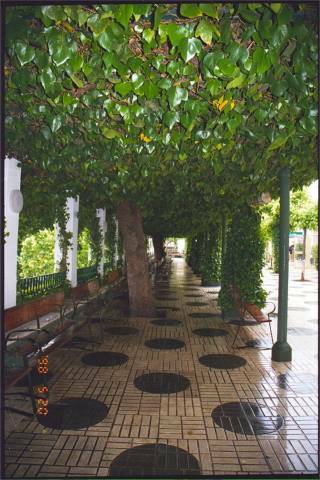 This restaurant is on the way to the spot, off Granada-Motril road, where Boabdil had stopped to look back at his Alhambra for the last time. It was at that spot where he wept on the loss of Alhambra and the Kingdom of Granada. His mother is quoted to have rounded on him: “You weep like a women for what you could not hold as a man“. This spot remains Suspiro del Moro – Moor’s Sigh (or Last Sigh of the Moor). The Alpujarras, a moutainous region between Lanjaron and Ugijar, lie on the southern slopes of the Sierra Nevada. The Sierra Nevada bound it on the north and the lesser Sierras of Lujor, La Contraviesa and Gador on the south. The Guadalfeo waters it. The villages of Pampaneira, Bubion and Capileira in this area cling to valley sides clothed with oak and walnut trees. 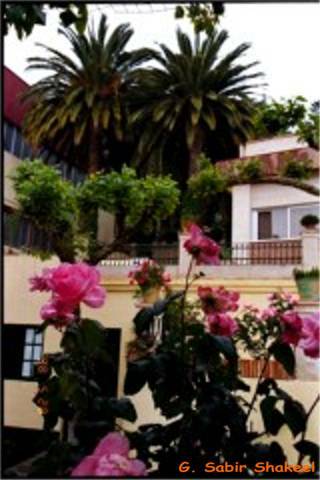 The Alpujarras rose to prominence in the 10th and 11th centuries as a great silkworm farming, supplying the workshops of Almeria, a principal city on the Mediterranean coast, with silk thread. 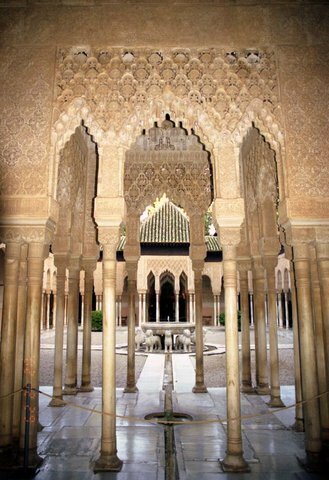 This entry was posted in Alhambra, Boabdil, Granada, King Ferdinand, Nasrids, Queen Isabella, Spain, Travel Destinations. Bookmark the permalink.